Small diaphragm condenser (SDC) microphones are usually more common with artists and musicians who record live. Unlike the large diaphragm condenser microphones, these (SDC) are mostly sought after due to their wide frequency response and great sensitivity. These 2 features boost these microphones’ accuracy as you record vocals and high-frequency sound sources such as cymbals, acoustic guitars, violins as well as stereo recordings. Similar to the large diaphragm condenser microphones, SDC mics tend to offer more versatility with increase in price. And they can be damned pricey. 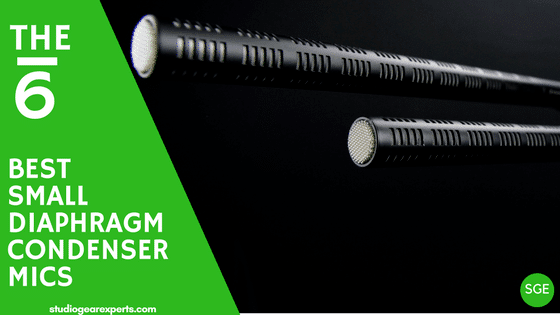 However, the market also has several cheap small diaphragm condenser microphones between $100 and $1000 price points that are easily affordable to the average home recording studio. Read on to discover 6 of the best small diaphragm condenser microphones in this category. AKG’s Perception 170 is a small diaphragm condenser microphone worth checking out. If you’re looking forward to venturing into AKG’s series of killer mics but don’t have much to spend on its high-end models, the P170 is their best small diaphragm microphone below 100 bucks. Also known as a ‘stick mic’, AKG Perception utilizes true condenser capsule technology enclosed in an all-metal rugged chassis. In fact, if you need a microphone that you can take with you for live recording, look no further than this. AKG Perception 170 comes in a cardboard box lined with foam. This enables the mic to take all the beating that may come its way down the road. About its performance, AKG Perception 170 can withstand up to 135dB of SPL. Amazingly, you can take this higher to 155dB by switching the 20dB pad. The ability to withstand high Sound Pressure Levels makes it amongst best small diaphragm condenser microphones for drums, percussion, and acoustic instruments. It’s fitted with a ½-inch diaphragm with a cardioid pickup pattern that rejects most off-axis signals. In use, this microphone’s 12mV/Pa sensitivity, 200 Ohms impedance, and 21dBA of equivalent input noise make it ideal for close-miking and other general uses. Not unless you are a microphone geek who has tried lots of other microphones before, it’s very likely that you’ve not heard of Samson mics. However, though not so big, Samson Technologies have made quite a name for themselves with their Samson C02. These small-diaphragm microphones are sold as a pair. Each of the 2 stick-mics measure 20 by 150mm. They are a real steal considering that the package costs below 150 dollars price point. This makes them the best microphones for a musician on budget. But how do they perform? Their spec sheets reveal a sensitivity level of -40dBV/Pa and a noise level of -40dBV/Pa. These 2 make it a good small diaphragm condenser microphone for several close-miking applications. The slight downside with the Samson C02 is its rather high 22dBA noise level which makes it quite hard to record quieter sounds. However, that’s not the manufacturer’s intended use. Samson sells these dual mics for use with instruments that require multiple mic placements including cymbals, drum overheads, and piano. However, their fixed cardioid pattern also makes the duo ideal for string instruments including guitar and violin. Samson C02 condenser microphones have an appealing 134dB of maximum SPL and 40Hz-20kHz frequency response ideal for your guitar amps and drum kits. Since its birth in the mid-1980s, the AKG C1000 has been a go-to microphone for any musician looking for a versatile studio recording microphone for use in quiet studios, on-stage, and on the road. While this was quite expensive for the average home recording studio artist, the latest C1000 S MK4 is not only affordable but has some advanced features too. The biggest advantage here is that you can use in field recording situations where access to phantom power is a bit hard. The MK4 has a battery ON/OFF switch just above the AKG logo that engages the 2-AA batteries which can serve you for up to 2 hours. A red LED flashes to assure you that the battery system is working. Notably, the MK4 can also utilize 9v-48v of phantom power. Switching over to its performance capabilities, MK4 offers both cardioid and hyper-cardioid pickup patterns. The essence here is to offer you with unmatched tons of flexibilities. You also get a 5dB pad to boost the microphone's sensitivity to between 5kHz and 9kHz depending on your projects. AKG C 1000 S MK4 also flaunts 132dB of max SPL when the pad is ON and a frequency range of 20Hz to 20kHz. This makes it good for decent close miking. Moving a notch higher to the best small diaphragm condenser microphones for around 400 dollars, our 1st option is this Shure KSM 141. The KSM 141 hears sounds from its top end. Though designed for studio use, this condenser microphone’s rugged construction offers you the opportunity to record your projects live. This mic comes in handy in virtually any recording application. This is made possible by its selectable pickup patterns. You can switch between its highly consistent cardioid and omnidirectional patterns simply by rotating its collar. Its internal circuitry mechanism reveals an ultra thin 2.5-micron low mass Mylar diaphragm with superior transient response. It also boasts a transformerless preamplifier that contributes to its excellent transparency and fast transient response and almost zero crossover distortion. This small diaphragm condenser microphone is also respected for its ability to handle extremely high SPL levels of between 134dB and 159dB. This is possible through its 3-position switchable pad with 0 dB, 15 dB, and 25 dB flexibilities. This mic also has a flat frequency response of between 20Hz and 20 kHz. Its high output level (150 ohms) and ability to withstand high SPLs makes it a good SDC microphone for acoustic instruments (piano, drums, strings, and drums), wind instruments (brass and wind) and low-frequency instruments (double bass and kick drum) as well. Next on line is a pair that you need to consider if you’re in need of the best small diaphragm condenser microphones for optimum instrument recording and live performances. Rode NT5 MP has no much to offer on its external design except for its heavy-duty satin-nickel plated body. These mics weigh a little over 100g. It’s also compact and features a pencil-like design which makes it easy for you to engage it in different applications. These mics are designed for live performances and recording acoustic instruments, overhead drums, and cymbals. Rode NT5 MP is an end-addressed mic utilizing pressure gradient acoustic principle and with an amazingly high maximum SPL of up to 143dB. Its -38.0dB/Pa sensitivity and 20Hz - 20kHz frequency range assures you accurate sound reproductions whether you’re using the microphones on a saxophone, acoustic guitar, flute, violin, or any other instruments within its performance spectrum. Worth noting, Rode NT5 MP has a super tight cardioid pickup pattern for optimum sensitivity to signals coming from its front and sides but objecting all audios from the rear. This makes it the best small diaphragm condenser microphone for indoor use. Filling our number 1 slot of the best small diaphragm condenser microphone under 1000 dollars is this Neumann KM 184. In case you’ve always wished to purchase one of the most luxurious microphones in the world, Neumann has them. This KM 184 is a good entry point to that level. At a glance, its small and compact design may make you a little bit skeptical performance which may again be furthered by its lightweight feel. However, the first encounter with its sound performance will doubtlessly blow you away. Neumann KM 184 is designed to carry on the mantle from the legendary Neumann KM 84 which was amongst the best small diaphragm microphones of the 70s. It has a flat and smooth frequency response ranging from 20Hz- 20 kHz. The thing with this SDC mic is that it retains its warmth and fullness across the frequency spectrum. Another step up feature from its predecessor is its 138dB of maximum SPL handling capability and a slightly lower 22dB of self-noise. This translates to a higher dynamic range which in return expands its scope of application. Speaking of application, Neumann KM 184 is a universal mic that can be used for close miking string and wind instruments, guitar amps, pianos, and percussion instruments.